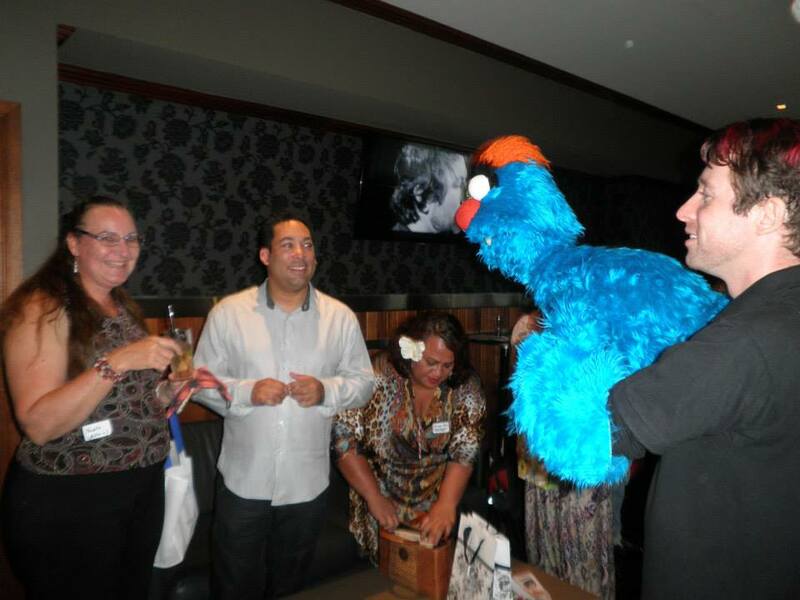 Faces light up when they’re approached by a roving Muppet-style puppet at an event! 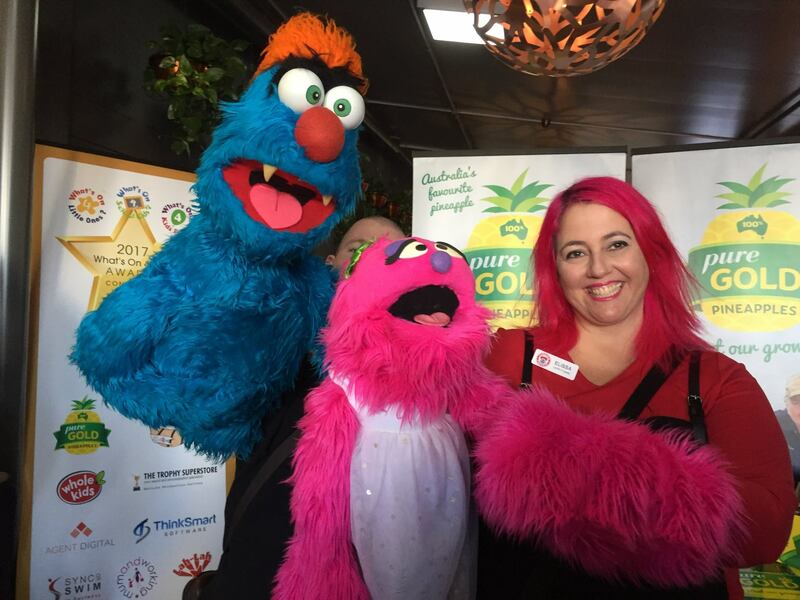 Blue monster Troggg, pink monster Flossy, or green monsters Moss or Frazzamatazz can rove around at your corporate event, product launch, dining precinct, shopping centre, wedding reception, markets, party, festival or fete! When they’re not performing a puppet show or puppet MC duties from behind a stage or lectern, Brett Hansen and Elissa Jenkins become roving puppeteers. Some people prefer a more casual cocktail style party where people can mingle and chat, rather than all sit down to a formal meal. Having some roving puppetry means the entertainment comes to you wherever you are in the room. $90 per hour (1 puppeteer), or $150 per hour (2 puppeteers). Troggg or Moss (with Brett) and/or Flossy (with Elissa) wandering around the event entertaining guests (no puppet stage set up). 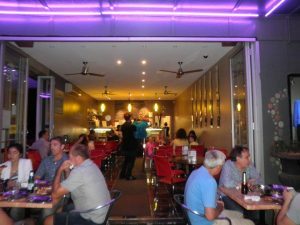 Humour and content will vary depending on audience at any given section of the event. There’s much improvisation and ‘in the moment’ conversation between the puppet character and the guests. Puppeteer arrives about 45 minutes before the event’s starting time to chat about where to wander, and any other instructions or requirements. The puppeteer can perform between 1 and 4 hours of roving puppetry, which includes opportunities for guests to meet, mingle and grab a photo opportunity (or selfie) with Troggg or Moss. Roving puppeteer, entertaining guests for 1 hour or more. For more information on grown up puppet performances Brett has been involved in, please refer to the drop down menu items about corporate events, party puppet shows for grown ups and our comedy theatre production, Thank Troggg You’re Here: A Puppet Impro Spectacular! 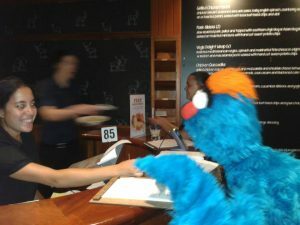 Brett was also a puppeteer cast member, and puppetry consultant with Brisbane Arts Theatre’s production of Broadway’s Avenue Q (trailer here), and worked on film projects Cluck: The Web Series and Heart of a Thousand Souls.